Or is there more to it? It's been a while since I've learned that there was a lot more to the obesity and diabetes epidemic than meets the eye, literally, and much more than what doctors have been telling us. I'm very close with a few Type II diabetics, and do you know who I blame for their health issues, that will now follow them the rest of their lives? I blame the mainstream thinking that began around the 1980's and was perpetuated by well-meaning but misled doctors and our government. This mentality told us that saturated fat was bad, that fake sugars were a good alternative, and that cutting calories was most important. I fell for it for a few years, too, but I think I was just young enough that it didn't catch up with me, and thankfully I had what I now call my food conversion in my mid-thirties before it was too late. What about you? How has your thinking changed over time about the obesity and diabetes epidemic? How to lower the glycemic index of foods — hint, it has a lot to do with healthy fats! Kelly, this is an excellent post and videos present great information – good springboard for finding out more and how to correct these factors that influence our metabolism. Thanks so much! I come from a family of diabetics–my mother, my grandparents and all of my sisters. Most of us are obese, including myself. I am morbidly obese and almost 50 years old. Several years ago, after my sisters had already been diagnosed with the disease, my doctor told me my blood sugar was on the high side and I may be insulin resistant. I’ve been on a food journey that began with eliminating corn from my daily (or weekly) diet. From there I eliminated starchy foods and processed grains. I’ve recently eliminated all forms of sugar except for that to make kombucha. My latest fasting blood sugar was 84. I have been helping one of my sisters with her food choices. After 2 weeks of eating better she had a fasting blood sugar of 97–the lowest it has been in years. I am sure medications exacerbate the complications of diabetes, but in my mind, diet plays the big roll. When my eye caught the title to your newsletter today I automatically saw red. I then had to step back and read your post. Please do not lump all diabetics into one column. 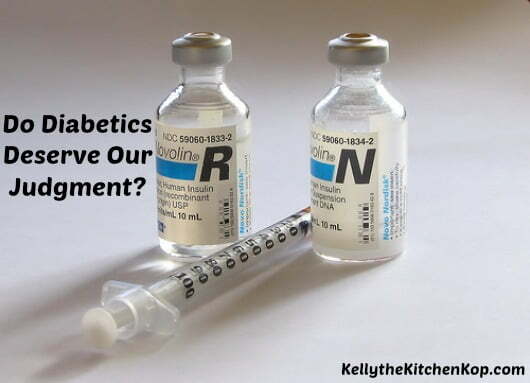 Type 1 diabetics and type 2 are should never be descrbed as “diabetics” since they are two separate diseases. Since you are friends with a type 2 you should know that. Also, as it has been pointed out, not all type 2 diabetics are over weight. Tonnia, I don’t think Kelly did that. Both type I and type II ARE diabetics. The reason is what is different. The end result is still that cells are not getting the insulin effect. You’re right. Many responders pointed out that not all type II’s are overweight. So did the article and video. But statistics show that about 80% of type II’s are overweight. The debate is, what cause what? So what was the point of your anger and seeming attack on Kelly? Where did you see the proof that 80% of type 2s are overweight? How much overweight? Five pounds? Who determines what “overweight” really means? BMI is meaningless since by that measure Brad Pitt and Arnold Schwarzenegger are “overweight”. Read “The Obesity Myth” by Paul Campos. Jenny Ruhl over at bloodsugar101.com has never been overweight. She goes to Type II conventions and looks around and most of the people there are normal weight. One of my grandmothers was a skinny little thing her whole life, in spite of having 6 kids, and had the worst raging case of Type II ever. She lost all of her eyesight and both of her legs to it. Everyone is so quick to be judgemental. Not everyone who is overweight even has a poor diet. Maybe you shouldn’t judge anyone. Wow, that Peter Attia video was so moving! And I hope it goes viral. I think he’s right, conventional wisdom has got it backwards. It’s not obesity causing diabetes, obesity is the result of the metabolic syndrome that also results in diabetes. Not everyone who gets diabetes is overweight. 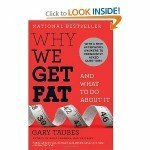 And as Tom Naughton points out in the second clip (citing Gary Taubes), it’s not that we gain weight because we’re eating too much, we’re eating too much because we’re overweight. Our cellular metabolism gets screwed up with improper diet. Thanks for showcasing these two videos, Kelly! Very helpful. I shared on Facebook. I rarely have time to watch the videos but I did this time and am so glad I did. I really admire this doctor for his open mind and humble heart! I hope he has great influence on our broken medical system. Thanks for sharing Kelly! From what I read this is unusual but I have eaten healthier and healthier (following WAP) over the last couple of years and have slowly “gained” weight? Why could this be? Can anyone help? How old are you? As we age our hormones make things trickier, that’s for sure! Again, many many factors play into all of this. I’m not sure if my comment will help, but I had the same problem. I think that when we come off the SAD diet and onto WAPF the food is so delicious and our bodies are so thrilled at all the good fats and nutrients, that we unconsciously eat more than we should. I didn’t think I was over eating, but lately I’ve been reducing my portion sizes a bit and I’m losing weight. I’m not hungry which is odd because I’m eating so much less, but I suspect it is because I make sure I get enough fat. I’ve also increased my activity significantly. I think that when eating a WAPF diet it’s important to get enough fat and stay active. Just my personal observations. I’m not a medical professional. 😉 you might want to look into Eat Fat, Lose Fat by Sally Fallon. You are supposed to gain weight as you age. It is protective. Read “The Obesity Myth” by Paul Campos. Skinny people have much higher rates of overall mortality. How do you account for a person diagnosed at age six years (in 1967)? What would you say is the reason she became diabetic? Type II diabetes used to be called “adult onset diabetes” and Type I was “juvenile diabetes” because that’s how it usually manifested, but patients are being diagnosed with Type II diabetes at lower and lower ages. I blame the conventional dietary wisdom, which makes people afraid of natural dietary fats, including saturated fat, and oblivious to the quality of food, so we end up eating poor-quality starches and sugars and too much of them, without sufficient fat and adequate, high-quality protein. Youngsters are also getting huge doses of high fructose corn syrup, which is even more devastating to health than sucrose, or table sugar (a mixture of glucose and fructose). It’s a recipe for disaster. Type I is an auto-immune disease. The islet cells in the pancreas are destroyed therefore they can’t make any insulin. There’s more to it even then that, I believe. There is a strong positive correlation between multi – year Paxil use and the development of diabetes. I think we are just beginning to see the diabetic explosion to come. There are also other possible corresponding factors, like the obeseogenic reactions our bodies have to certain types of plastic. I don’t think we know the whole story yet, and I’m not sure we ever will. Also, it’s clear now that statin use makes it easier to develop diabetes. 1.the symptons they told me were diabetes I’d had my whole life, 2. my greatgrandfather was half choctaw Indian a diabetic on insulin, 3. diabetes is about 80+ percent in the Native American community. I have Choctaw Indian from 2 family lines, Cherokee Indian from another and Creek Indian from another. My diabetes is inherited from my ancestors. I talked to a man the other day who had a type of cancer only seen in Asian people, his doctor had only seen one other case of it. I asked him if he had did any geneolgy research to see if he had Asian ancestors, he said his family was from England 200 years ago. Wrong dude you have an Asian family line somewhere. I have 4 grandparents they each have 4 grandparents, get the picture. Do your geneolgy folks everything is heretity and quite letting them make you fell guilty. Genetics can certainly influence susceptibility, but it’s the combination of genetics and environment (primarily, the food we eat and to an extent the drugs we take) that takes it from possibility to actuality. I understand that many if not all Native American communities were removed from their ancestral homelands, disrupting economic and dietary traditions. People lost their way to provide for themselves and became to an extent wards of the U.S. government. And we know how well the government does at dispensing dietary advice! On top of that, the diet of the dominant European culture (including alcohol and refined foods) wasn’t suitable, and you add it all up and it’s no surprise there is a serious problem with diabetes, etc. It’s like the dominant culture only worse. I think it also illustrates how returning to our ancestral diets is a good first step for everybody.